If you’re familiar with Fantasy Grounds you can create your PC in Fantasy Grounds, export the PC and send it to the GM who will run your game. 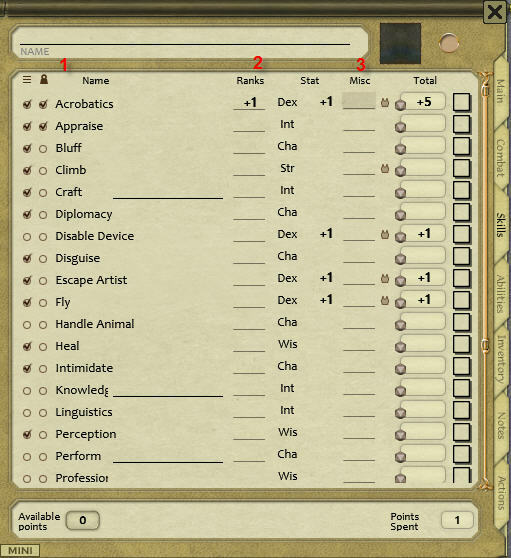 You can use option 2 below to import your character from Hero Labs or PCGen to get you most of the way there – just do some checks and fine tuning in Fantasy Grounds before sending your PC to the GM. Note: this option is now available to free license users (it didn’t used to be). Create your PC in Hero Lab or PCGen and export the PC in a format that the GM can use to get the PC into Fantasy Grounds. Send the GM a legible electronic copy of your PC. This is the least preferred approach as this requires the GM to spend time entering your PC into Fantasy Grounds. GMs are already overworked getting their games ready for the convention! If you’re new to Pathfinder Society, or don’t have a PC ready to play, you can play a Society legal pregen (details of the pregens available on the Paizo PFS Site under the “Pregenerated Characters” link). We have these ready to go in Fantasy Grounds, so just let your GM know that you want to play a pregen (and which one) and you’ll be good to go. If you familiarise yourself with the pregen before the game that will help a lot as well. More details on the above 3 options are available in the sections below. 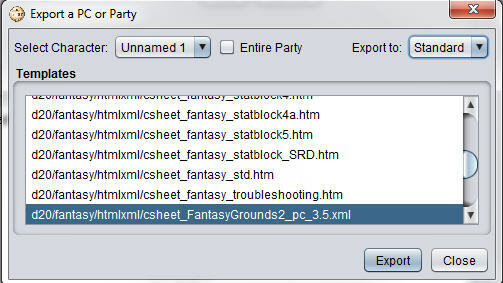 If you have at least a Fantasy Grounds “lite” license (player license) you can enter your PC directly in Fantasy Grounds and then export the PC in the form of an XML file and send this to your GM to have loaded ready for your game. 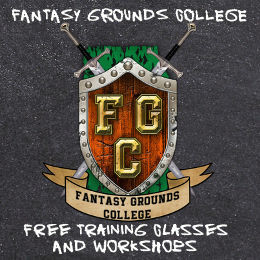 Create a brand new character from scratch with the “Manage Characters” functionality of Fantasy Grounds – available to all versions of Fantasy Grounds, including the free version. 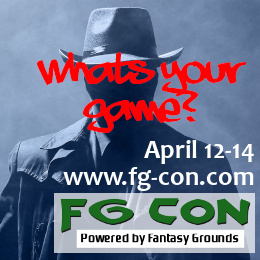 Or, if you have a “full” or “ultimate” Fantasy Grounds license you can create a new Pathfinder (PFRPG ruleset) campaign and create your character in the campaign. The process is very similar. 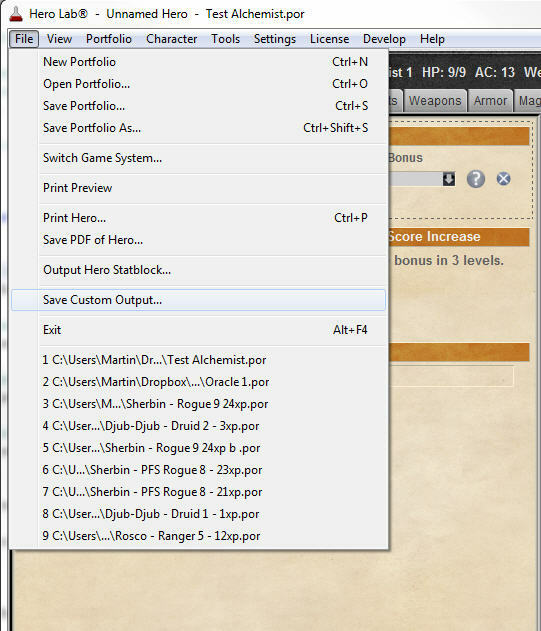 Create a character in Hero Labs or PCGen, export them in the included Fantasy Grounds format and the use the Fantasy Grounds character converter to import into Fantasy Grounds. Then you can start Fantasy Grounds and fine-tune the PC as necessary. See the following section for details on importing from Hero Lab or PCGen. 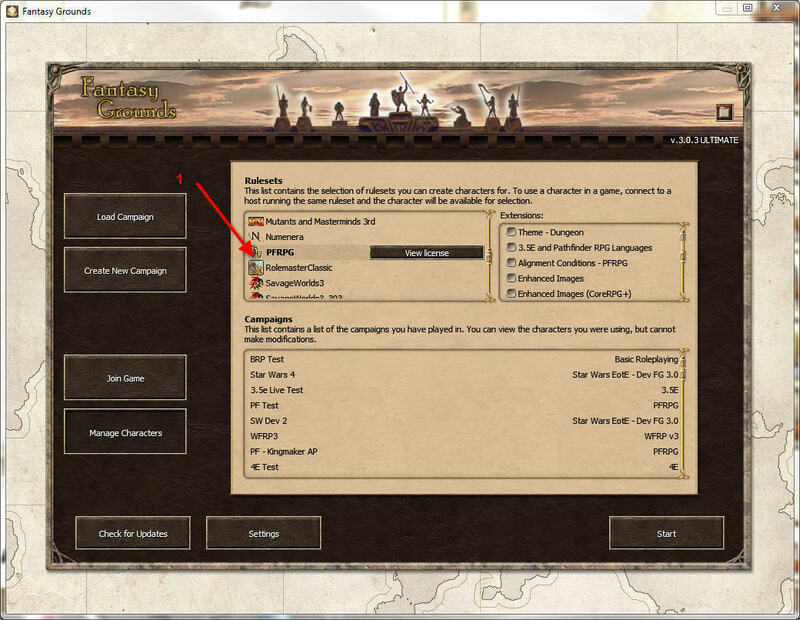 The following instructions are for the “Manage Characters” functionality of Fantasy Grounds, the process is very similar for doing this within a campaign. 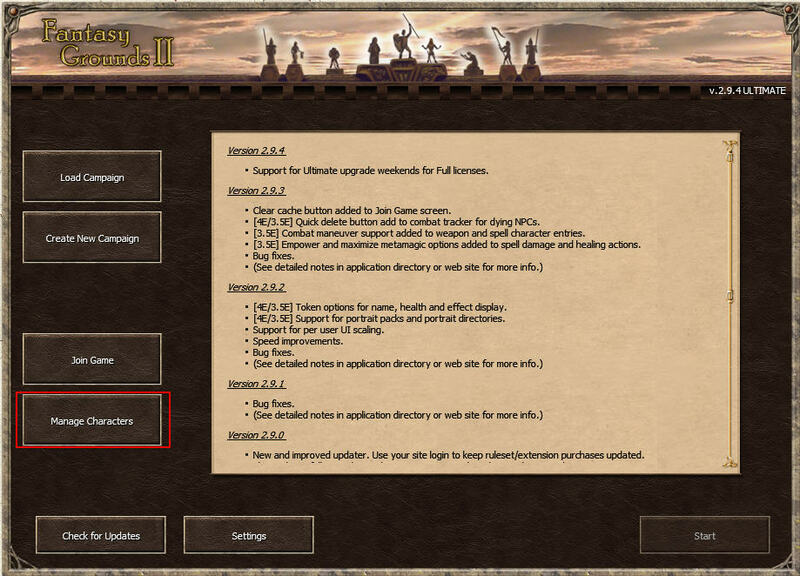 Select the “PFRPG” ruleset (1) and press the “Start” button (2). Fantasy Grounds will then start loading – this may take a couple of minutes. You will need to create a new character. 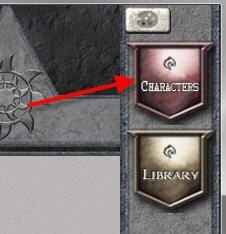 In the top right hand corner is the “Characters” icon – click on this. 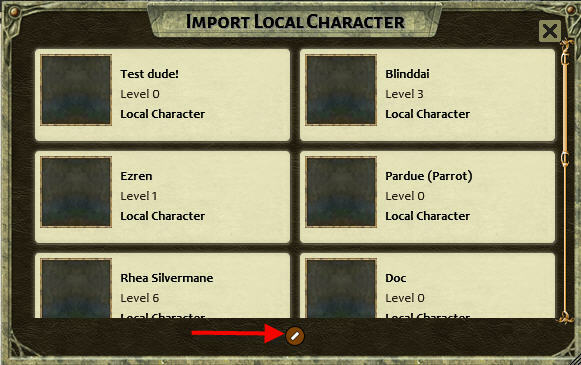 The “Import Local Character” screen appears. Click on the “edit list” icon. The following screenshot shows characters already in the local character cache – the first time you enter this screen it will be empty. You will get a blank character sheet – all ready for you to fill out with your PC information! 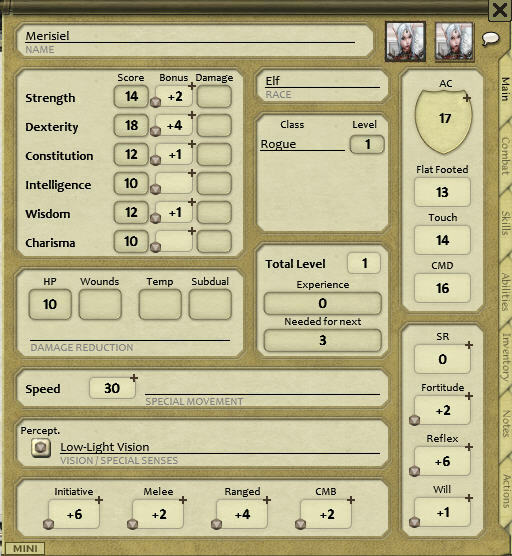 There are a number of tabs down the right hand side of the character sheet: Main, Combat, Skills, Abilities, Inventory, Notes and Actions. On the “Skills” tab, check/tick the circles under the lock icon (1) to indicate which skills are class skills for your character – this will automatically add the required +3 for class skills when at least 1 rank is added to the skill. Add your PC ranks (2) and any miscellaneous modifiers the skill/s may have. Check that the “Total” is correct for each skill. On the abilities tab, right-click in the Feats (1) or Special Abilities (2) section and select the “Create Item” option at the bottom of the radial menu. 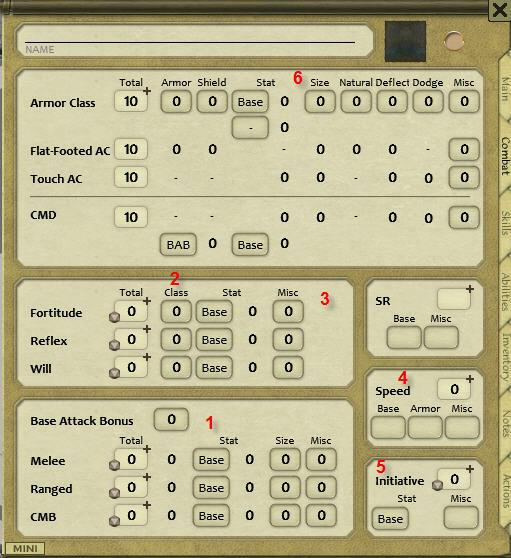 Fill in the feat/ability name in the line that appears on the screen, then click the red dragon link to the right of the name and fill out the main section of the box that appears with the feat/ability description – it can be handy to have the Paizo PRD or the d20pfsrd websites open to copy/paste descriptions into the ability window. 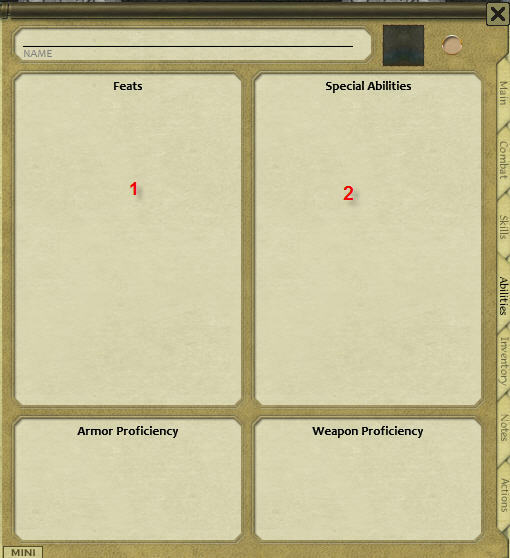 When the ability is complete, press the “X” icon in the top right of the small window to return to the main character sheet and continue filling out the feats/special abilities. Hero Lab is a commercial product – more information can be found here. Hero Lab can export a Fantasy Grounds compatible file (.hlfg) that can be used to quickly take your PC from Hero Lab into Fantasy Grounds ready for play. 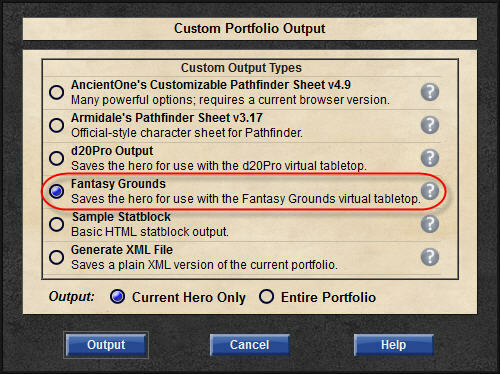 If you are familiar with creating your Pathfinder Society character within Hero Lab you can export your character by selecting: File -> Save Custom Output… -> Fantasy Grounds and press the “Output” button. Remember where you save the .hlfg file and send this file to your GM/con admin when they request it. 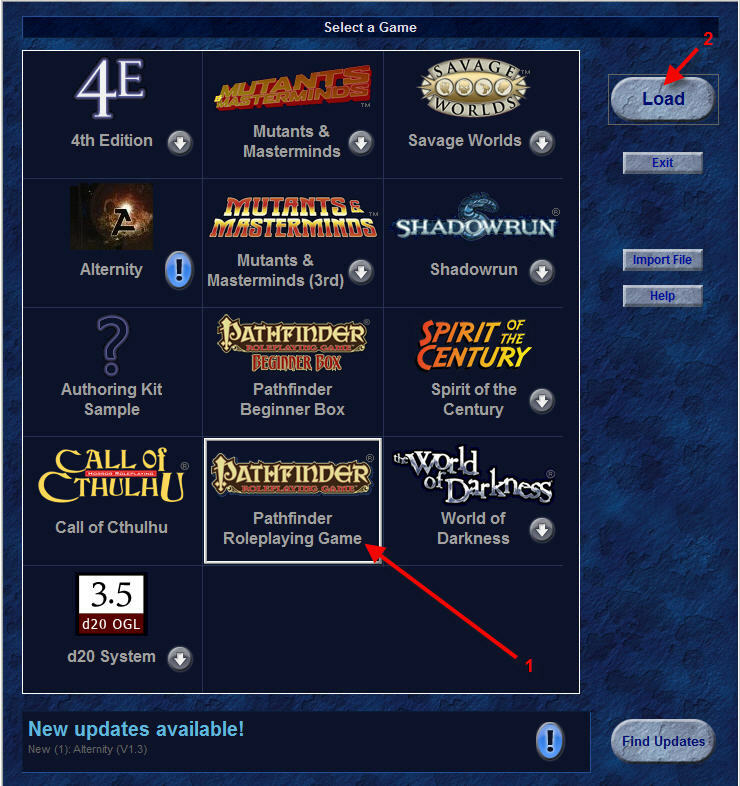 Open up Hero Lab and select “Pathfinder Roleplaying Game” (1) – do not select the Pathfinder Beginner Box. Then press the “Load” (2) button. When the “Configure Your Hero” screen appears make sure you select the “Pathfinder Society Organized Play Character” option. Then fill out the Hero Name, Player Name, Pathfinder Society ID # and Character # for this character. Press OK. When the main screen appears, start filling out your PC. If you’re unfamiliar with Hero Lab or unsure where to start, press the “Help” menu and select “Hero Lab Tutorial”. When you have completed your character (ensure there are no validation errors), save the portfolio and then use File -> Save Custom Output… to save the file in the Fantasy Grounds export format. Select a name and location for the export document (*.hlfg) file. Press “save”. Remember where you saved the .hlfg file and either send this to your GM when requested, or if you have at least a lite Fantasy Grounds license you can load this file into Fantasy Grounds using the Character Converter application included with Fantasy Grounds – see the section “Using the Fantasy Grounds Character Converter” below. Please use version 6.00.1 pf PCGen. PCGen is a free product available for download from here. PCGen can export a Fantasy Grounds compatible file that can be used to quickly take your PC from PCGen into Fantasy Grounds ready for play. PCGen documentation can be found at here. The “Character Creation Walkthrough” is a good place to start. 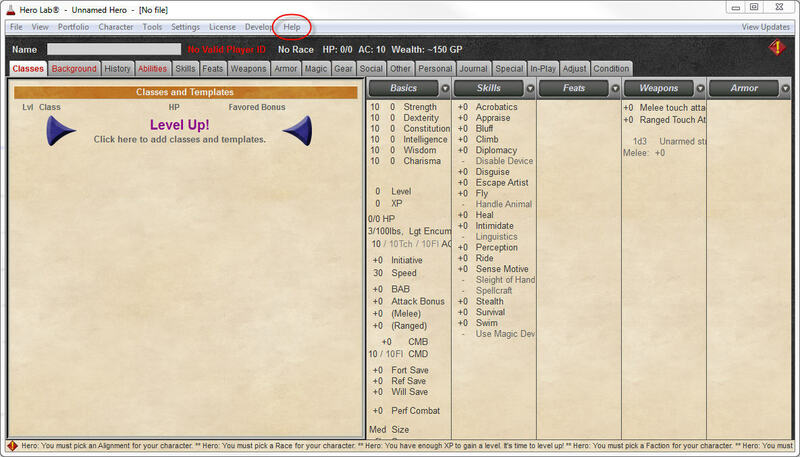 When you have completed your PC you can export your character by selecting: File -> Export -> select the d20/fantasy/htmlxml/csheet_FantasyGrounds2_pc_3.5.xml template and press the “Export” button. Remember where you saved the .xml file you exported and either send this to your GM when requested, or if you have at least a lite Fantasy Grounds license you can load this file into Fantasy Grounds using the Character Converter application included with Fantasy Grounds – see the section “Using the Fantasy Grounds Character Converter” below. 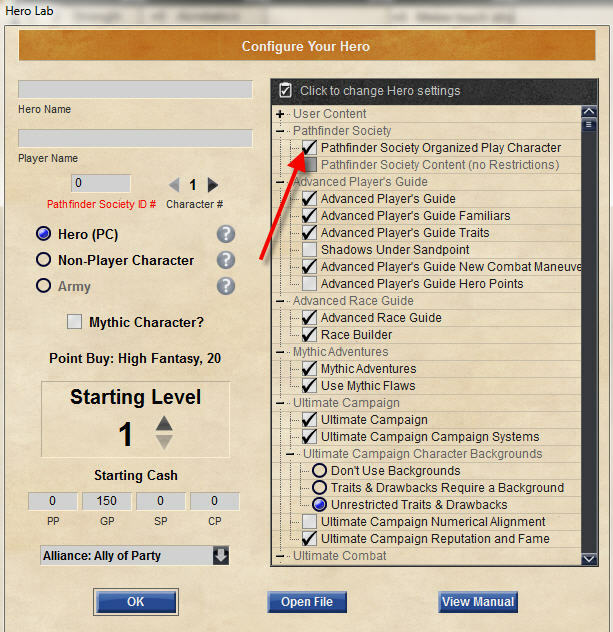 The Fantasy Grounds Character Converter can be used to import a Hero Lab, PCGen or other Fantasy Grounds exported character into your local Fantasy Grounds installation. Carry out the steps below to import your character into Fantasy Grounds – do not have Fantasy Grounds running while you do this. 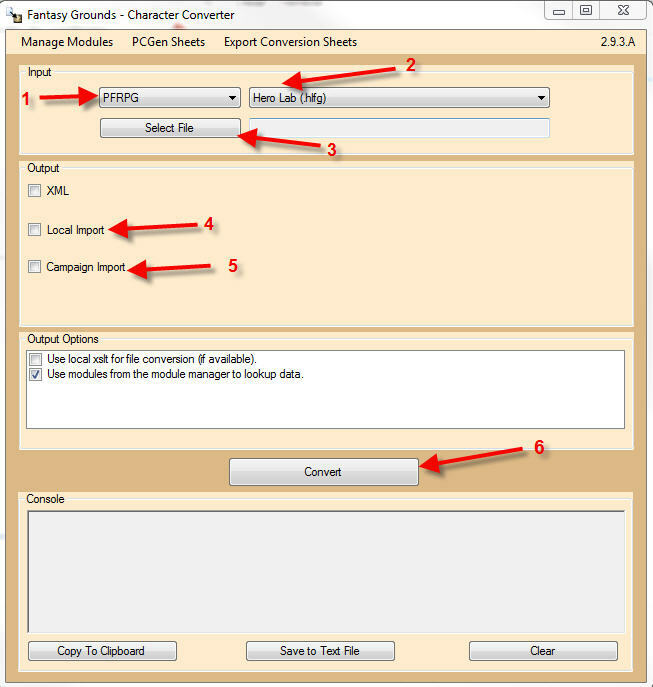 The Character Converter is installed in the \utilities folder of the Fantasy Grounds Application Data Folder – this is accessed by clicking the “Open data folder” icon in the top right of the main Fantasy Grounds start-up screen, which will open up a Windows Explorer window – open the “utilities” folder and run the CharacterConverter application. Select PFRPG for the input rules. 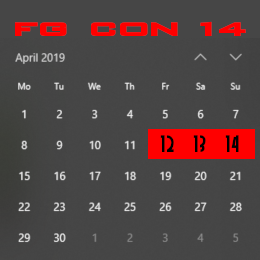 Select either “Hero Lab (.hlfg)”, “PCGen (.xml)” or “Fantasy Grounds (.xml)” depending on what input file you are using. Press the “Select File” button and in the file selection window navigate to where you saved your export file earlier and select that file – Press the “open” button to take you back to the character converter. If you have a lite license (or a full/ultimate license and wish to use the FG Manage Characters option) select “Local Import”. If you have a full/ultimate license and wish to administer your character in a campaign select the “Campaign Import” option and select which campaign you want to import the PC into in the campaign selection section that appears. Press the “Convert” button and wait until the Console window at the bottom reports a successful conversion and import. Do not have Fantasy Grounds running at this stage. 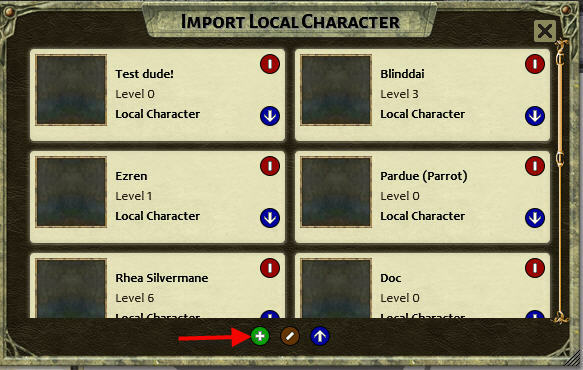 If you selected “Local Import” you can open up Fantasy Grounds and follow the steps in the “Creating/Updating your PC in Fantasy Grounds” section above – you should see your PC in the “Import Local Character” screen. This is the least preferred method as it puts a lot of extra work on the GM to manually enter your character – please try to use one of the methods listed above to get your character into Fantasy Grounds, only use this approach as a last resort. Please do not just send a scan/photo of a hand written character sheet – the GM will more than likely find it hard to read your sheet. Please make use of one of the electronic character sheets available here or any similar electronic character sheets. 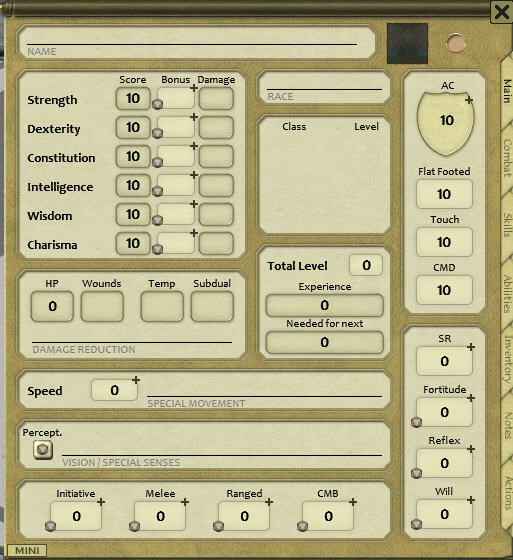 Complete your character in one of the electronic character sheets – include all items, weapons, spells, etc. and check the maths in the sheet is correct. Then email the sheet to the GM/con admin when they request it.